Don’t miss the latest coupon and promo code, available for this week at JOANN Fabric stores or online. 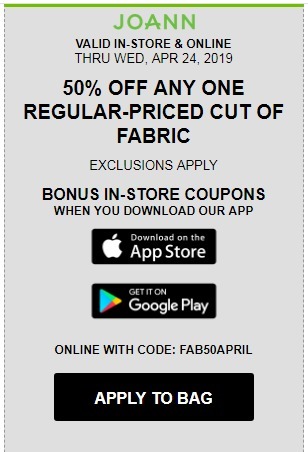 Find the JOANN Coupon – 50% Off Any One Regular-Priced Cut Of Fabric – valid through Wednesday, April 24, 2019. If you shop from the remnants bin, you get 50% off the regular price of an item. The price is marked down at the register, but this is only worth purchasing if the project is small or you need only a small amount of fabric testing or quilting. Don’t forget about the clearance rack either.